In Match 7 of VIVO Indian Premier League 2019 (IPL 2019), an umpiring howler off the last deliver cost Royal Challengers Bangalore dearly as Mumbai Indians pipped the hosts by six runs largely due to Jasprit Bumrah's brilliant spell at the death at Chinnaswamy Stadium in Bengaluru on Thursday. 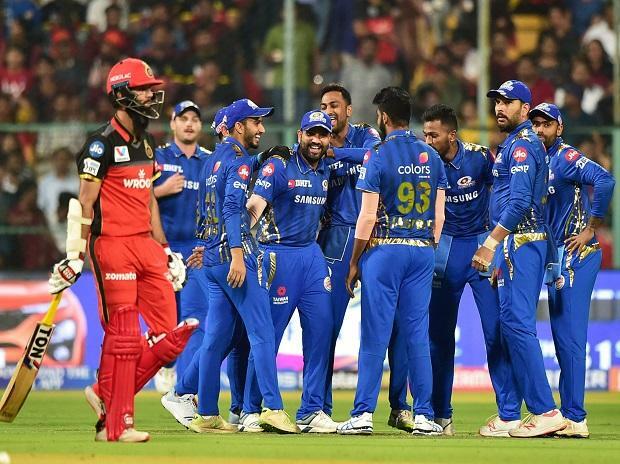 Needing six to take the game into Super Over, Lasith Malinga's final delivery to Shivam Dube was a no-ball that was missed by the on-field umpires as RCB managed 181 for 5 in reply to 187 for 8 by Mumbai Indians. What hurt them more was AB de Villiers, who nearly took his team to victory with an unbeaten 70 off 41 balls would have faced the free-hit. Both umpires C Nandan and ICC Elite Panel's S Ravi bungled completely leaving Virat Kohli seething in anger. But nothing can be taken away from fit-again Bumrah's mastery at the death as he singlehandedly won it for MI with superb 17th and 19th overs. During chase, Kohli signalled his intentions at the beginning itself hitting Jasprit Bumrah for three consecutive boundaries in one over. Hardik Pandya was slashed through the point and cover driven for successive boundaries. Mayank Markande, who dismissed Parthiv Patel (31 off 22 balls) with a googly was hit for a straight boundary by Kohli. On the day, Kohli became the second man after Suresh Raina to complete 5000 runs in Indian Premier League. Put into bat, Hardik muscled a couple into the stands and one out of sight to help Mumbai Indians recover from a middle-order collapse and post a decent 187 for 8. Pandya hit three sixes and two fours in his unbeaten 32 off 14 balls after Yuzvendra Chahal (4/38 in 4 overs) reduced MI from a comfortable 124 for 2 to 147 for 7. MI lost five wickets in a space of 3.3 overs for only 23 runs. This was after a vintage Yuvraj Singh was raising visions of a six sixes over with three maximums in Chahal's 14th over. However he wasn't fourth time lucky as Chahal's courage to maintain flighting the ball yielded results. It was then left to Hardik Pandya to score the bulk of the 30 runs in the final two overs to take MI to a fighting total on a placid batting track. In fact, Hardik's third and final six went out of the stadium as he gestured to the dressing rooms pointing his bulging biceps.